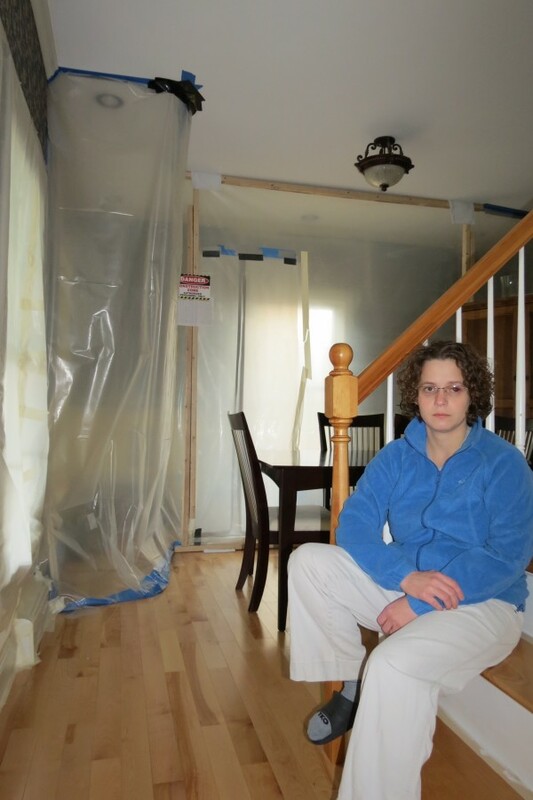 Bethany Ward inside her 2005 modular home that is full of mold she believes is making her sick. 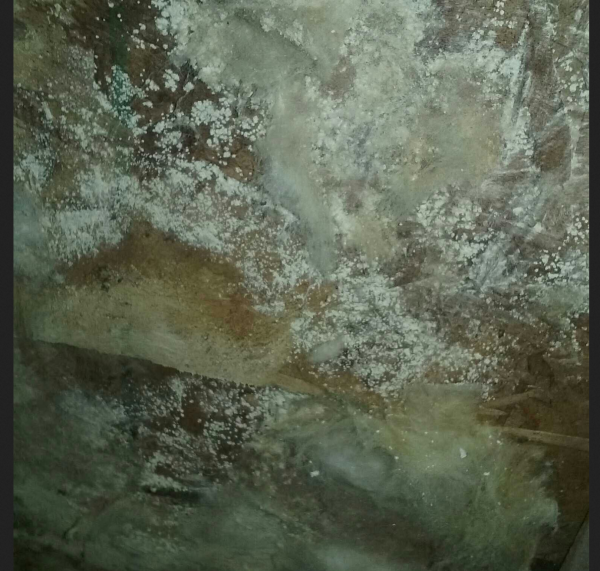 Some of the mold that was found inside the walls of Bethany Ward's home. WISCASSET, Maine — When Bethany and Brandon Ward purchased and moved into a pre-owned modular home in Wiscasset at the beginning of 2013, they breathed a sigh of relief. The move cut down on the commute for Brandon Ward, a new assistant principal in Boothbay. Bethany, his wife, a middle school teacher who had stopped working after getting acutely ill from Lyme disease, was planning to look for work in the area once she was feeling better. But that’s not what happened, according to 32-year-old Bethany Ward. The Wards didn’t learn the cause until this summer, when they opened an access panel to get to the plumbing and discovered that their house harbored an ugly, unhealthy secret: It was ridden with mold. “When I took it off, the mold smell just hit me in the face,” Bethany Ward said. Since then, she and her husband have learned more than they ever wanted to know about the difficulties and expense of remediating a mold problem and the impossibility of seeking legal relief from either the company that built the modular home or the contractor who installed it 10 years ago. Both are now out of business. Bethany Ward said she wants to tell her story in part as a warning to other people who, like her and her husband, might inadvertently purchase an unhealthy house. According to Doug Dunbar of the Maine Department of Professional and Financial Regulation, the state tracks the number of modular homes sold to Mainers, in part because the state regulates a one-year warranty on the homes. The annual number of modular homes sold to Mainers peaked at 1,623 in 2005, with a sharp dropoff in home sales beginning in 2008. Dunbar said the decline can in part be attributed to the Great Recession. He said that officials with the Maine Manufactured Housing Board would be pleased to speak with the Wards about their situation, but that because the house was built 10 years ago, there may not be much help to offer. “It’s unclear whether the previous owners took actions that could have caused or contributed to the problem — such as adding more insulation or blocking air flow,” he said. The 2,000-square-foot home cost the Wards just over $200,000. It was advertised as a good condition home that was move-in ready. But the couple has learned it had never been correctly sealed or vented and the attic was not properly finished. 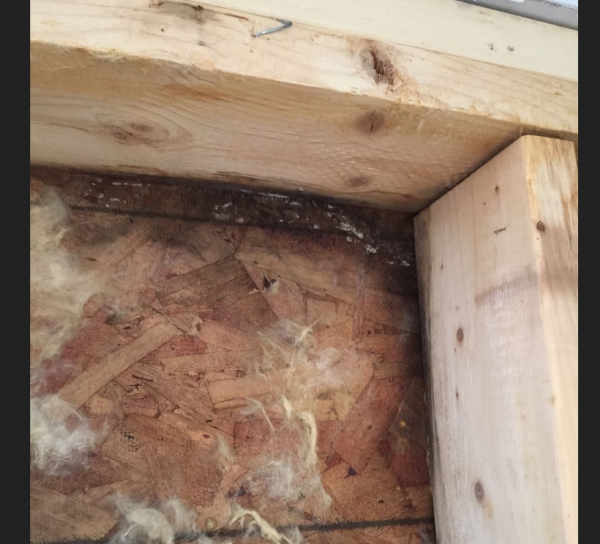 The excessive moisture that got inside had no way of escaping and created a perfect environment for mold, which spread behind the sheetrock and the insulation. In the months since they discovered the systemic mold inside their walls, the Wards have consulted air quality, building and energy efficiency experts, and they have learned that fixing the problem is a lot harder than avoiding it in the first place. That’s not easy, either, said Chris Corson, an expert in passive house design and construction, who has checked out the Wards’ home. His Searsmont-based panelized construction company, EcoCor, specializes in energy-efficient, healthy houses, but he believes that there are many poorly built homes in Maine. While plumbers and electricians are required to be licensed, Maine builders are not. And although they are supposed to follow residential construction standards, some do not. For example, five years ago, he saw a house where the builder had used duct tape to flash the windows into a weather-resistant barrier. Unsurprisingly, the strategy had weathered poorly, and the windows were leaking. He said that consumers do more research when they buy a $20,000 automobile or even a $100 microwave than when they purchase a house, one of the largest investments they are ever likely to make. Unlike with cars or appliances, there’s not a lot of information to go on for aspiring homeowners. Corson believes there should be a law mandating that all homes have a mechanical ventilation system. Canada requires a whole-house ventilation system, but there’s no similar regulation in this country. He said that whatever the Wards end up doing to remediate their problem will be expensive. Kathleen Meil, the marketing and customer service manager of Evergreen Home Improvement in Rockland, said that, in general, indoor air quality is a serious concern in Maine, where homeowners must consider such issues as radon, mold, mildew, dust and indoor air pollutants. While her company works to help people increase energy efficiency in their houses, they can’t neglect air quality as they are doing so. “Our perspective is that building a tight house is a great thing, and tightening up a drafty house is a great thing — but you need to get it properly vented,” she said. According to U.S. Environmental Protection Agency guidelines, the air in a home should turn over every three hours, Meil said. More often than that can be a disaster from a heating perspective, but less often can be problematic in terms of air quality. In the winter, most of a home’s fresh air is coming through the basement. Evergreen Home Improvement does a lot of so-called “basement encapsulations” to create a barrier that prevents moisture from getting inside the home. That’s been hard to do for Bethany Ward, who believes her mold-infested house is making her sick. But she has run out of ideas to solve the problem. Between the mortgage payments, student loans and medical bills, the couple doesn’t have a lot of spare cash to spend on mold remediation. They don’t have a lot of equity in the home, and she is pretty sure it would be appraised at a fraction of what they paid for it if they sought a home equity loan to do the remedial work.